What’s better than being with Mom on Mother’s Day? Enjoying AMT’s newest Original Show Country Classics with her on Sunday, May 13, AND getting her ticket for FREE! 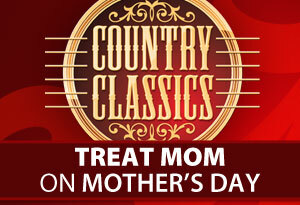 That’s right … Bring Mom to see Country Classics at 3:00 p.m. on Mother’s Day, May 13, and she gets in free with the purchase of one regularly priced adult ticket. Offer valid for May 13, 2012 only, with the purchase of one regularly priced adult ticket. Valid for new orders only. Phone and walk-up orders only. Not valid online.